Stay Longer & Save More: Enjoy 25% Off! Stay Longer & Save More: 25% Off on your stay at Pathumwan Princess Hotel, Bangkok by MBK Hotels. 25% discount on Best Available Rate Room Only and Room with breakfast. Daily breakfast at Citi BiSTRo (For Room with Breakfast only). Complimentary Super High Speed WiFi 30+Mbps. 20% discount on food & beverage (except Ping’s Restaurant & Tatsumi). 35% discount on seafood buffet at CiTi BiSTRo. MBK shopping discount card. Pprincess member card. Book Now. Save 10% on Your Booking!! Save 10% on Your Booking at Pathumwan Princess Hotel by MBK Hotels, Thailand. Use promo code: member. Book Now. Advance Purchase: Take 15% Off!! Advance Purchase: Take 15% Off at Pathumwan Princess Hotel, Bangkok by MBK Hotel. Daily breakfast at Citi BiSTRo (Room with Breakfast only). Complimentary Super High Speed WiFi 30+Mbps. 20% discount on food & beverage. 35% discount on seafood buffet at CiTi BiSTRo. MBK shopping discount card. Pprincess member card. 12PM Early check in (subject to availability). Book Now. Stay Longer & Save More: Get 20% Off. Stay Longer & Save More: Get 20% Off on your stay at Tinidee Golf Resort by MBK Hotels, Phuket. Stay Longer and Save More. Stay minimum 2 nights. 20% Discount on Best Available Rate Room only & Room with Breakfast. Daily breakfast at Loch Palm Club House (Room with Breakfast only). Free High Speed Wi-Fi access for 24 hours. Free access to Fitness Club at centric Life. ‘MAYA’ Welcome Drink upon arrival. Free late check out (Subject to availability). Book Now. Book Now & Save Up to 15% Discount. Book Now & Save Up to 15% Discount at Layana Resort by MBK Hotels, Koh Lanta Yai. Special discount on Best Flexible Rate. Free breakfast at SeaSky restaurant for 2 persons. Welcome Drink Upon Arrival. 20% discount on Food at SeaSky Restaurant (Room service is not applicable). 20% discount at Linger Longer Spa. Early check-in and Late check-out (Subject to availability). Free High-Speed WIFI internet access. Fruit Basket in Room. Book Now. Advance Purchase: Get 20% Off!! Advance Purchase: 20% Off on your stay at Tinidee Hotel Golf Club by MBK, Bangkok. Free Room Upgrade from Superior Room to Deluxe Room. 20% Discount from Best Flexible Rate. Free High Speed Wi-Fi Access for 24 hour. ‘MAYA’ Welcome Drink upon arrival. Complimentary Drinking Water 2 bottles. Book Now. Chinese New Year Deal: Enjoy 25% Off!! Chinese New Year Deal: Enjoy 25% Off + SkyTrain access at Pathumwan Princess Hotel, Bangkok by MBK Hotels. 25% discount on Best Available Rate Room Only and Room with breakfast. Complimentary ticket of Skytrain BTS One Day Pass per person per stay (maximum 2 tickets per stay). Daily breakfast at Citi BiSTRo (For Room with Breakfast only). 20% discount on Food at any restaurant (except Ping’s Restaurant & Tatsumi). 35% discount Seafood Buffet at Citi BisTRo. Complimentary Super High Speed WiFi 30+Mbps. Book Now & Enjoy Chinese New Year!! We're MBK Hotel & Tourism. 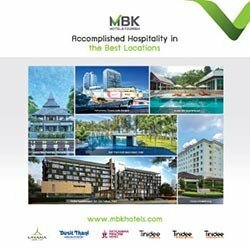 The MBK Hotel & Tourism Co., Ltd. is a member of the MBK PLC Group. We have a vision to create a dynamic new standard for management and services in the hotel industry and achieve the highest recognition by the public in every potential area, both domestically and internationally. We also operate a tourism business with professional and dedicated management focused on the needs of customer, investors, and other stakeholders.